アマダOBにつき、アマダ製品に関してメンテナンスは全てお任せ下さい。購入前の試運転から、メンテナンスのアフターフォローまでバッチリ! 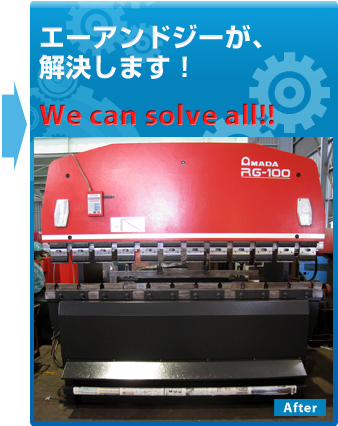 !海外出張も致します。All of our engineers worked at AMADA JAPAN, and have great deal of familiarity with AMADA products. It's available to do maintenance and service in your country. We take on inspection for specific press model(obliged by Japanese law). 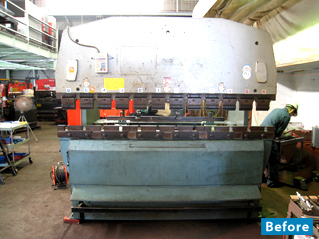 We support to transfer your machines. Need to periodically get the oil change. Using old blade affect the quality of the final products. Increasing of defective products, some troubles, sounds or oscillations badly, running slowly etc.